[Model Answer] Geography: Market based refinary's implications on a country? 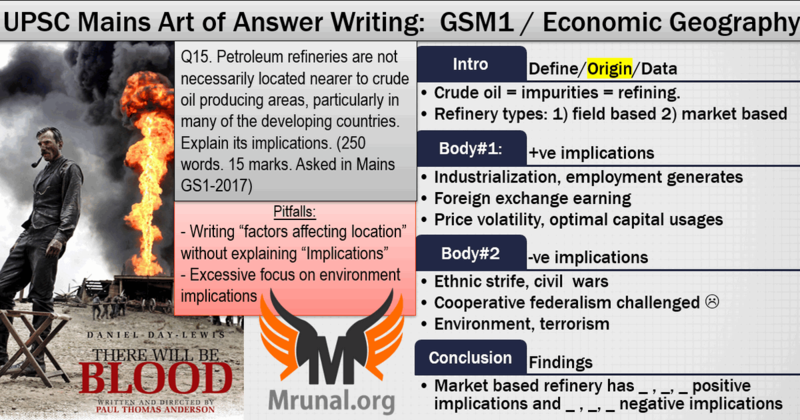 [Model Answer] UPSC GSM1-2017/Q15: Implications of Market-based Petro Refineries on developing country? Define: “Petroleum has been derived from the word ‘Petra’ meaning rock, and ‘Oleum’ meaning oil….” But, this type of introduction looks pathetic and juvenile. Data: We can give statistics related to % of oil supply from major regions of the world, or number of barrels produced by market based refineries in developing countries. But difficult to actually recall such data in exam, so better start with origin. Refining process generates many useful byproducts having applications in chemical, pharmaceutical, paint, plastic and fertilizer industry. This helps in employment generation and economic development in the given region, even if it doesn’t have an oil-well nearby. Thus they help earning foreign exchange and controlling the current account deficit. Oil field can be exhaust in future, but market can last for a longer period. Thus establishing refinery near to consuming market helps in optimal utilization of capital intensive infrastructure. Because it can draw crude oil from multiple fields from multiple countries. It also insulates developing country from abrupt supply disruption arising from socio-political issues or UN sanctions in the exporter country e.g. Libya or Syria. Most of Sudan’s oil reserves are in the south, but most of the refineries and shipping facilities were created in the norther Sudan – both because of geographical reasons (easier to export via tankers through Red sea) and political reasons (more jobs for Northern tribes). This, and many other factors had fueled anger among the south Sudanese that the north had became prosperous using south’s natural resources, and yet they were denied adequate share in governance of Sudan. 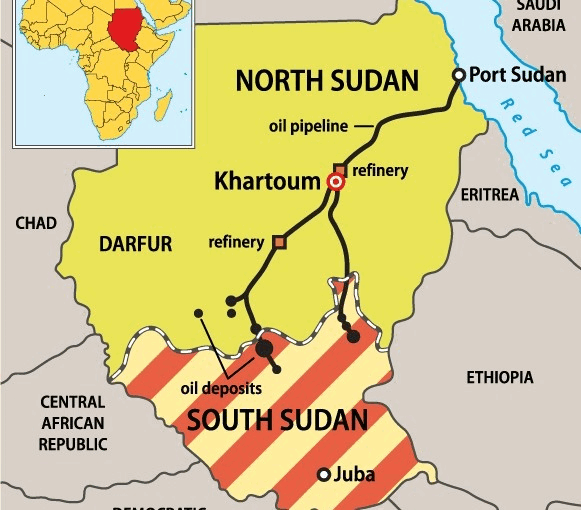 But, South Sudan is an independent but landlocked country, and its only oil-pipeline to the sea runs to (North) Sudan. Thus, South Sudan’s oil reserves are useless without the north’s cooperation, which has created further acrimony in their bi-lateral relations. “India-not-involved” type IR affairs are no longer part of Mains-GSM2 syllabus. So, unlikely that many candidates follow such developments. Post-independence, the first major discovery of oilfields in India was at Naharkatiya, Assam in the 50s. Industrialists were of opinion that refinery should be located at Calcutta, because then the refinery could sell the products in and around Calcutta and the surplus products- like the coast-based refineries in Bombay and Vishakhapatnam. Assamese leaders wanted the refinery to be setup within their state to create jobs & economic opportunities. For defense and strategic reasons, opening refinery at Assam was unsafe due to possible attacks from China and Eastern Pakistan. Barauni refinery’s products could be distributed in the upcountry region via Patna-Nagpur- Amritsar, using the favourable and faster transportation system than the products arriving from Bombay and Vishakhapatnam. This would also force both port-refineries to cut down their prices. According to some critiques, Congress’s inner-party politics was more in favour of creating jobs in Bihar than Assam. 1) Noonmati refinery is located near Bramhaputra to draw its water for its refining processes and for its township. But, the silting in Bramahputra creates water-crisis on routine basis, which 1) forces this refinery to partially shutdown its operations, and 2) begin dredging & de-silting operations. Thus it generates less than optimal profits. 2) Barauni Refinery was ordered to temporarily shut down by the Union government (2018) because of grave contamination of Ganga river. ..When Government decides to setup refinery away from oil-field, especially in a a different state, then it creates challenge to cooperative federalism and provides propaganda point for the secessionists, as seen in Noonmati-Barauni refinery issue during 50s and 60s. When refinery is away from oil well, the crude oil has to be transported via tanker or pipeline. The oil spillage from either mode of transportation can be disastrous to marine and land based ecosystems respectively. Refineries emit harmful gases and affluent, irrespective of location. Enemy states and terrorists consider them as high-value targets. Therefore, refinery closer to market poses more threat to environment and human population, compared to a refinery close to an oil producing uninhabited area. E.g. the air pollution from Mathura refinery is a threat to both Taj Mahal and its surrounding human habitats. Barauni Refinery was ordered to temporarily shut down operations by the Union government (2018) because of grave contamination of Ganga river. Avoid temptation to elaborate excessively on how exactly oil-spills harm environment to pad the answer. Because this question is asked under GSM1-Geography and not for GSM3-Pollution. For a developing country, a refinery located near market has both positive and negative implications. On one hand it helps in jobs-creation, economic growth and foreign exchange earning whereas on the other hand it can pose challenges to national integrity, environment and safety of the citizens. In real exam, you’ll not get opportunity to write as many sub-headings as I’ve done. But, I’ve written the subheadings to highlight the main idea of each paragraph, so that you can understand how I arrived at the conclusion. Thus, when you structure your thoughts in a proper sequence and have clarity about the “Main idea” in each paragraph or bullet point, then it requires less effort to write a conclusion. 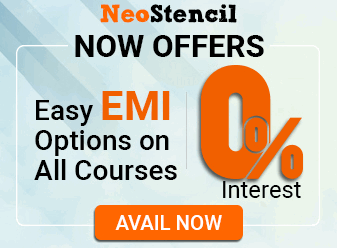 I’ve taken the introduction and examples from NCERT 11-12 Geography textbooks. Positive and negative implications based on the inputs of candidates with Geography optional. After exam, it’s possible to search and prepare the exhaustive list of implications. But in real exam time constrains, usually most candidate can’t think beyond 1) environment 2) jobs angle. So, any points / deeper insights written beyond that = a good enough answer. My answer is ~1100 words, because I had to elaborate for educational purpose. Once you compress the main ideas of each paragraphs, automatically it’ll fit within the 250 words limit. Thanks for your explanation in that way.. Awesome..